You will be greeted at the Port of Livorno, scenic route in the Tuscan countryside, before arriving at the Renaissance city of Florence. You will explore the Church of Santa Croce, the Duomo and Baptistery, the Ponte Vecchio, the Pitti Palace, and the Piazza of Michelangelo. You may choose to have your lunch here and You will spend the duration of your day sightseeing throughout this native land of Michelangelo, before you are returned to the Port of Livorno at the end of the day. 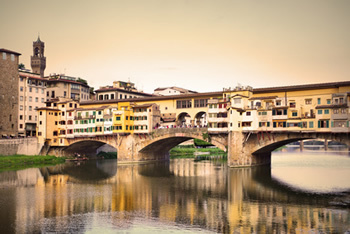 We do highly recommend a private licensed guide for Florence. Florence is partly wheelchair accessible. Please Book the tickets starting from 11 am. For the clients that form a group, please make sure everyone has the same time for each museum. It is recommended to visit only the Accademia on this excursion. Please note that the Accademia and the Uffizi museum are closed on Mondays! Doesn't include Lunch, Private Tour Guide, Meals,Entrance fees and gratuities.